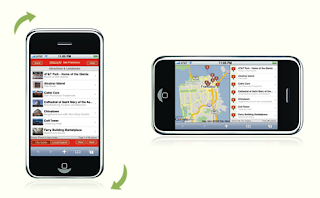 Schmap, offers iPhone consumers new rotating city guides, local search and maps. These new map-services on the web allow you to feel a uniquely interactive experience: maps and guide content are dynamically integrated, allowing intuitive, real-time access to reviews and photo slideshows for places of interest. Directing your iPhone Safari browser to www.schmap.com takes you to your Schmap homepage, where you can choose to browse through "City Guides" broken down by categories (restaurants, shopping, etc.) or search for local businesses in your area. Schmaps gives you a unique opportunity to browse through their "City Guides." With the iPhone in portrait orientation, Schmaps presents a list of local businesses. But, turn the iPhone into the landscape (horizontal) orientation and Schmap will rotate the screen and list the businesses next to a map showing the location of each business. Schmap's local search function is currently unavailable as the service is still in beta development. To see how it works, visit the site with your iPhone and enter access code 724627.